Rosie made a surprise visit the week she died. I entered the room and saw her sitting on the floor looking down at a framed photo of me with a microphone in my hand, wearing a white dress and a fierce face. The tiny plastic figure of Rosie the Riveter is one of the many bits of inspiration sprinkled about my home. 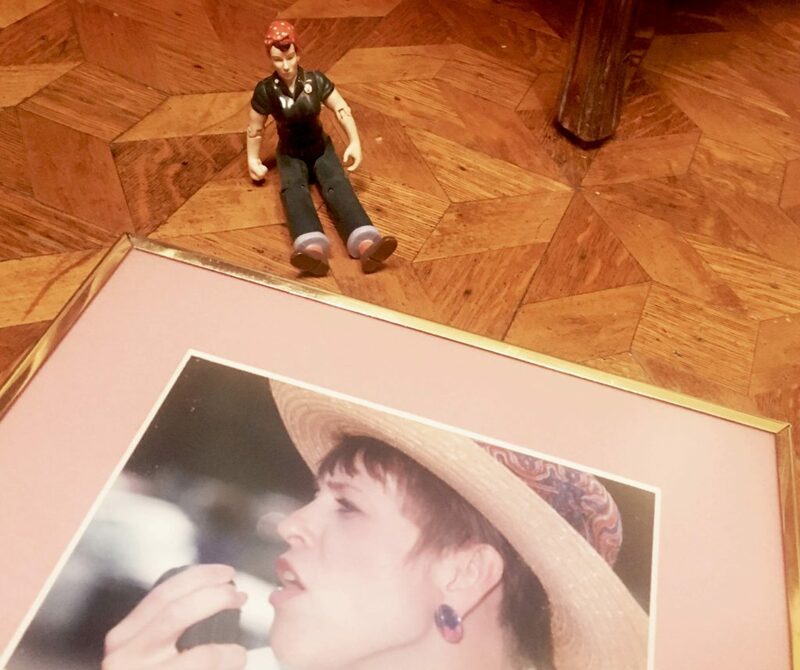 She had fallen off my bookshelf along with the picture of me giving a rallying speech at a women’s march held decades before. Naomi Parker Fraley, the woman whose photograph inspired the original image of the beloved icon of the “We Can Do It!” movement died just a few days before at the age of 96. She died on the very day thousands in my hometown marched to be a voice for the multitude of messages from #metoo to “I march for my daughter.” That day as I marched, as I had the day that photo was taken decades before; I wore a single tiny button pinned to my winter jacket: Rosie. When men went off to World War II, millions of American women took up jobs in factories and shipyards. Rosie represented their strength, competency, and patriotism. Rosie represented hard work, independence, and grit, all of which I’d clung to for much of my life. This strong spirit got me through a lot in life. Law school. Divorce. The death of my brother. My mother had eight years of education and eight children and people called her a saint. Who was I, with my career and only two children, to think I should ask others for help? Performing on my own, I carried a secret belief that my martyrdom made me better. I have made my life so much harder than it needed to be because of an ego that refused to admit that I was overwhelmed, hurting, or simply spent. All around me were good people who would have gladly been my “We,” but I had refused to lift my nose up from the grindstone long enough to see that they were right there beside me. The price of my carefully cloaked arrogance was distance from those who cared about me, because I was doing it alone. Where have you made your life more difficult because you have not let in support? What is the fear that gets in the way of you revealing what you need today? If you were being your most courageous self, what help would you ask for?